With this special beer, Garrett & Greg introduce you to the welcoming spirit of the Aloha State. 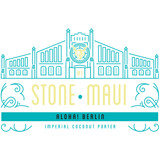 Echoing their past collaborations, this beer abounds with ingredients familiar to the islands-rich coffee and pounds of hand-toasted coconut-and introduces hazelnuts into the mix. The result is deeply rooted in Hawaii, San Diego, Europe and friendship, capturing the true essence of the word "aloha," which also means on a deeper level "joyfully sharing life." So sit back and slip into island time with this imperial beauty. Cheers, prost & 'okole maluna!